Tropical box or palmwood is in fact a general term for woods with comparable properties to the European boxwood. Hard and dense, warm, clear tone. It is a beautiful decorative wood, that often gets confused with rosewood (Dalbergia) and is often called African Rosewood. It is however a completely different species. 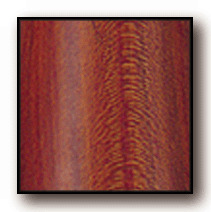 Bubinga produces a beautiful, warm, full tone. A Japanese emperor owned a staff made of Camelia and said it had the power to ward off spirits. The sound is similar to Boxwood. Similar to boxwood, wonderfully light yet suitable for both ensemble or solo work. Some of the lightest and most comfortable altos and tenors we carry are made of cherry. hard and dense, elegant, clear tones. The traditional choice for solo work. Boxwood is a dense, heavy wood. It is the traditional wood for 16th and 17th century recorders. The sound of boxwood recorders is warm, clear and prominent. Due to sourcing problems, European boxwood instruments are all but impossible to find these days. Also called African blackwood; a very hard, dense night-black wood producing consummate solo instruments of striking beauty and remarkable stability. This wood is not a sub-tropical wood and does not grow in the world's great rain forests. A simulated ivory, exact in grain and acoustically very close. Maple is a light-coloured wood. It is susceptible to moisture and mildew and is therefore impregnated with wax. A close grained wood producing mellow-toned instruments, particularly tenors and basses. Maple recorders have a mellow, soft tone..
Hard and dense, warm, rich tone. A subset of rosewood, palisander is darker, denser and plays closer to ebony. Pearwood is medium heavy wood. a hard fruitwood (shown unstained) producing a clean, mellow tone. Amazingly enough, most plastic instruments have good tonal quality. They are suitable for beginners and people in need of a second, outdoor or practice instrument. The resonance of maple combined with the durability of plastic is a nice compromise. Many European makers offer plastic heads to students and then allow them to upgrade to wooden heads when they progress. Hard and dense, warm, resonant tone. Rosewood is a heavy wood. This wood has been known in Europe for over 200 years. The tone of rosewood recorders is clear and prominent. A wood of exotic beauty producing excellent ensemble and solo recorders with a warm but strong tone.